Organic hibiscus flowers are a great addition to tea blends, jams, baked goods, salads and beverages. Extract the essence for use in soaps, shampoos and other skin and hair products. 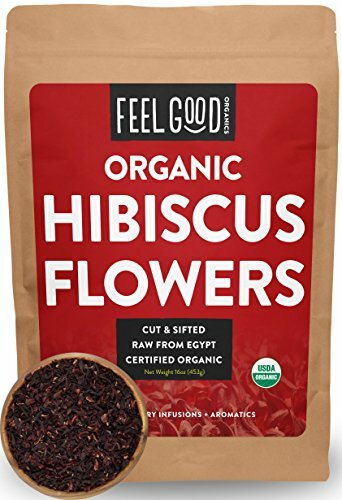 This resealable bag contains 16 ounces (1 Pound) of certified organic, 100% raw cut and sifted hibiscus flowers from Egypt. Where does the Hibiscus come from? Egypt. Our 100% raw, certified organic Hibiscus is imported to the USA directly from Egypt. Do you add anything to the Hibiscus? No! Our organic Hibiscus is 100% raw with no additives. Yes! Our Hibiscus comes packaged in the highest quality kraft bags. The bags are made with a resealable zipper, 5-layer structure with foil lining, rounded corners, and a tear notch for easy opening. How can I use Hibiscus at home? Organic hibiscus flowers are a great addition to tea blends, jams, baked goods, salads and beverages. Extract the essence for use in soaps, shampoos and other skin and hair products. Steep in hot water for tea. Simmer for an aromatic potpourri. Fill custom craft sachets. If you are not 100% satisfied with your purchase for any reason, just email us and we’ll refund your order in full – no questions asked!